In America, drinking water comes from lakes, rivers, and groundwater. In most states water will go through a comprehensive purification process: water goes through intake points to treatment plants to storage tanks to the pipes in our houses. Within this process many chemical changes occur. In coagulation and flocculation, chemicals are added to the water, which causes the dirt particles, called flocs, to clump (Tan, 2016). Depending on the water, whether it is acidic or opaque, the flocs’ density can vary (What is Floc? - Definition from Corrosionpedia). These flocs settle at the bottom of collection tanks because of their high density in a process known as sedimentation. The next step is filtration, where the water moves through filters composed of sand, gravel, and charcoal to remove dust, parasites, bacteria, viruses, and chemical particles. This step is followed by disinfection, where chlorine or chloramine is added to kill parasites, bacteria, viruses, and germs. Additionally, in some places fluorine is added to prevent tooth decay (Tan). Interestingly, there are several areas in America which protect water at its source, which are known as watersheds. The most famous areas for protecting their watersheds are Seattle, and, surprisingly, New York. In fact, water in New York does not require the filtration process. Rather it is only disinfected with chlorine and ultraviolet light (Tan). Water has many properties. Water is polar, meaning its molecules are very attracted to each other. Because of water’s polarity, it has the ability to dissolve many substances, earning it the name “the universal solvent” (Solvent properties of water). Water’s strength as a solvent is very useful in a lab setting; however, water can be dangerous in the environment when in contact with hazardous chemicals: “wherever water goes, either through the air, the ground, or through our bodies, it takes along valuable chemicals, minerals, and nutrients” (Perlman). Therefore, water absorbs many valuable minerals and nutrients, but it can also absorb and transport hazardous chemicals. Once water is collected from its source (like reservoirs and aquifers), it goes through various treatment plans, is stored, and travels through pipes to reach consumers. Distribution systems are supposed to have a constant supply of safe drinking water (Drinking Water Distribution Systems, 2017). However, distribution systems can contaminate safe drinking water. Deterioration of necessary equipment can lead to pipe breaches and main breaks. Therefore, materials should be maintained and updated. Additionally, outdated distribution systems can lead to serious health risks (Drinking Water Distribution Systems). One of the most well known examples is in Flint, Michigan. The water supply in Flint became contaminated when the city switched its water supply and did not take the right precautions: not using a corrosion-control treatment to prevent lead pipes from corroding to produce dangerous lead compounds that could then move through the water system. As a result, drinking water became contaminated with lead compounds and many people in the community grew ill (A closer look at what caused the Flint water crisis). The human body contains about 120 mg of elemental lead, which is partially absorbed by the intestines. But being overly exposed to lead can lead to colics, skin pigmentation and paralysis. Additionally, lead poisoning causes neurological issues and encephalopathy (Lead (Pb) and water). Elemental lead is not soluble in room temperature water; however, lead compounds can be soluble in slightly acidic water and are extremely toxic. Organic and inorganic lead compounds can result in cerebral swelling and congestion, but organic lead compounds are absorbed more quickly and strongly affect women, especially their ability to reproduce. Additionally, children are more susceptible to lead poisoning than adults, and symptoms include lower IQs, behavioral changes, and difficulty paying attention. All of these symptoms are a result of lead poisoning: lead building up in the human body because of its insolubility (Lead poisoning, 2016). Recently, Michigan state has decided to stop providing Flint residents with free bottled water as they claim the water now meets federal standards. However, many of the lead pipes that contaminated the water in the first place are still present and will hopefully be removed by 2020 (Fortin, 2018). The lack of response has led many to believe that the Flint water crisis has not been resolved because residents of the city are predominantly black and live below the poverty line (Martinez, 2016). Another instance of inadequate equipment leading to water contamination is the Bhopal chemical leak in 1984. A leaky pipe caused an exothermic reaction, a reaction that releases a lot of heat energy and increases the rate of reaction. The chemical that leaked was methyl isocyanate, an odorless and colorless gas vapor (Johnson). The untrained management of the chemical plant did not notify the public of a chemical leak, and police and emergency responders took hours to come to the scene. By then, thousands of people, inside and outside of the factory, died of methyl isocyanate poisoning. The factory was located in a very impoverished area, where people were actually living on the fence line of the factory. Therefore the majority of the victims were poor (Johnson). Even though this event happened over 30 years ago, Bhopal is still affected by this disaster. After the Indian government declared that the Bhopal site was safe, a Swiss lab did an investigation and found some alarming results: high levels of chloroform in Bhopal’s groundwater (Goodman, 2009). Chloroform is an organic compound that is denser than water — therefore it sinks — and is slightly soluble in water. It is a good laboratory solvent; however, it is hazardous. Chloroform is a central nervous system depressant and a gastrointestinal irritant. Ingesting a large amount of chloroform can cause cardiac arrest and ingesting a small amount can lead to liver and kidney damage (NOAA Office of Response). Although the majority of water contamination comes from human error and/or neglect, water contamination can occur from natural sources. One of the deadliest naturally occurring contaminants is arsenic. Arsenic is a metalloid, meaning it possesses traits of a metal and a nonmetal. When in a compound, arsenic is extremely toxic (Arsenic in water). Elemental arsenic is insoluble in water, however, if the water is slightly acidic, arsenic will form other compounds and dissolve in water (Lurain, 2018). Arsenic can occur in the environment, especially in soil; this is concerning because matter can easily leach from water to soil and vice versa. Only 10 ppb (parts per billion) of arsenic can lead to serious health risks: various skin conditions and skin and lung cancer (Arsenic in water). One of the worst cases of naturally occuring arsenic contamination is in Bangladesh, where some concentrations of naturally occurring arsenic have surpassed 100 ppb (Arsenic in water). Although the cause of contamination is still questioned, the most reasonable conclusion is that Bangladesh is a natural geological source for arsenic (Arsenic Contamination In Groundwater In Bangladesh: An Environmental And Social Disaster). The authorities have known about this crisis for over 20 years, but people, mostly those who are impoverished, continue to consume water with high levels of arsenic. Part of the problem is Bangladesh’s health system and government, which have prioritized providing safe water to political allies and neglected the poor who inhabit rural Bangladesh (Bangladesh: 20 Million Drink Arsenic-Laced Water, 2016). Those who live in rural Bangladesh continue to collect water from contaminated shallow hand pumped wells, instead of deeper wells, which provide much better water quality. Exposure to arsenic can cause many health issues, including various forms of cancer, developmental issues, impaired motor functions, skin lesions, and heart attacks(Bangladesh: 20 Million Drink Arsenic-Laced Water). The public in Bangladesh does not connect most of these symptoms to arsenic poisoning because of their lack of education. Additionally, once a person develops visible symptoms, they are ostracized because people are scared and are not aware of what caused the symptoms. As a result, approximately 43,000 people in Bangladesh die annually from arsenic poisoning (Arsenic Contamination In Groundwater In Bangladesh: An Environmental And Social Disaster). No place is immune to water contamination, but some places have done more than others to combat water contamination through regulation. In Europe, the Urban Waste Water Treatment Directive was created to collect, treat, and discharge water, especially for industrial uses (Water pollution - overview, 2018). In the United States, the Clean Water Act was passed in 1948 and was expanded in 1972. The act declares that it is illegal to release any pollutants into bodies of water without a permit. The Environmental Protection Agency also has various agencies to monitor and control water contamination: the National Pollutant Discharge Elimination System, the Office of Water, and EPA Watershed Academy (Summary of the Clean Water Act, 2018). Additionally, the United States has made it a priority to have safe and functioning chemical factories. For example, in West Virginia, a chemical plant identical to Bhopal was built; however, proper precautions were taken to make sure a disaster like Bhopal would not ensue: computer systems used to monitor functions and leaks, educated workers, and proper materials (Diamond, 1985). Still,many of the same mistakes continue to be repeated all over the world. 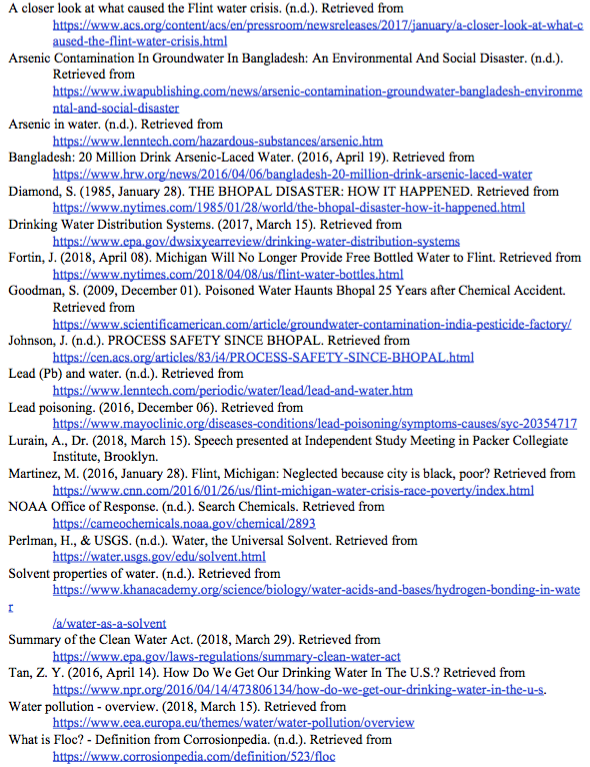 A major issue has been the responses to instances of water contamination; all of the examples in this essay are still affecting people. This lack of response is unacceptable and disproportionately affects the poor. Not combatting water contamination in impoverished areas perpetuates the cycle of poverty and denies people of the most basic need: water.